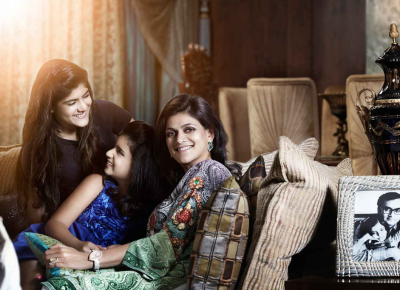 Last month, when the world celebrated Women’s Day, Plan India – a member of Plan International – launched the coffee table book My Daughter, My Shakti (Meri Beti, Meri Shakti) – under the auspices of the ‘Because I am a Girl’ campaign. Bhagyashri Dengle, executive director and spokesperson, Plan India, Govind Nihalani, chairman, Plan India Board and Sapna Kar, the chief advisor, BIAAG project have spearheaded this initiative. Authored by Sathya Saran, the work focuses on the parent-daughter relationship and spotlights several parent-daughter pairs. The idea of the book was conceptualised by Govind Nihalani, chair of Plan India. It is an advocacy initiative that engages celebrities and social influencers to join in to celebrate our daughters by sharing their personal stories as a parent. The interviews reaffirm Plan’s philosophy, that investing in girls through education and ensuring equal opportunities for our daughters; and for every girl, we are actually investing in the future of our society. You have chosen a mix of parents. How did you achieve that selection? Change in attitudes towards girls and their rights is required across all levels of society. One in three girls around the world is denied an education by the daily realities of poverty, discrimination and violence. Thus it is equally important to celebrate people who may not be what the world sees as ‘celebrities’, who have supported their daughters’ visions and dreams via education and empowered their girls. I think these stories actually make the book more ‘inclusive’ and more ‘real’. What is the biggest legacy a parent passes on to a daughter? I am happy that the book is not only about mothers and daughters; it has as many fathers in it. The role of men in encouraging and supporting girl’s rights is equally important. I think every parent should firstly make their daughters believe that they have the ‘Shakti’ within themselves. And secondly provide them the love, encouragement and opportunities to unleash that ‘Shakti’. Every educated and empowered daughter is sure to pass on these values to her kids and hence the change and impact is lasting and continuous.